"You have heard that it was said, 'Love your neighbor and hate your enemy.' But I tell you, love your enemies and pray for those who persecute you, that you may be children of your Father in heaven. He causes his sun to rise on the evil and the good, and sends rain on the righteous and the unrighteous. If you love those who love you, what reward will you get? Are not even the tax collectors doing that? And if you greet only your own people, what are you doing more than others? Do not even pagans do that? Be perfect, therefore, as your heavenly Father is perfect." What a tall order this is! I am to love those that don't accept me and pray for those that shout hate towards me? How is this possible? I mean, don't you know that as being gay, you put up with people prosecuting in the name of God! And yet, Jesus tells us to love them and pray for them. One time a friend of mine told me that I should pray for those that I don't like. She said say the prayer and then use an imaginary gun acting like you shoot them away. I tried this and what changed? Not them and their actions, but me! I soon didn't have to pretend to shoot them, instead I found myself caring for them and wanting good for them. My heart changed! It is hard when you see hate coming your way to meet it with love though and prayer. I hear regularly that God hates me because of my lifestyle choice. I hear that I am going to hell. I hear the hate and misunderstanding in the voice. And all I can do is meet that with kindness, love, and prayer. 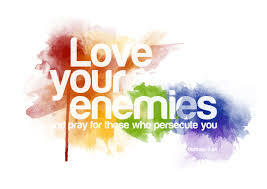 Not only does God say that I should love my enemies, pray for those that prosecute me, but I should forgive others. That don't say forgive friends, family, those you like, but others meaning all! In order for me to be forgiven, I have to be forgiving! Another tall order! I don't want to forgive those that spew hate towards me! I don't want to forgive people that use God's word to promote their ill intentions! So how does one forgive? Prayer! See prayer is the answer to knowing how to be loving and forgiving! God will provide the way to be so! If our hearts are with Him, then there is nothing that can't be done! Just means it is not easy and we have to pray for the strength to meet hate with love, kindness, forgiveness, and prayer! May you find in God the strength to do so as I am learning still today to let God guide me in how to be more loving, forgiving, and pray for those that I don't like!